In June quarter, net profit of Century Plyboards (India) rose 7.28% to Rs 43.05 crore in the quarter ended June 2016 as against Rs 40.13 crore during the previous quarter ended June 2015. Sales rose 10.10% to Rs 403.62 crore in the quarter ended June 2016 as against Rs 366.60 crore during the previous quarter ended June 2015. Inspite of poor state of construction sector, Century managed to post reasonably better set of numbers in last financial year. In FY 2015-16, net profit rose 11.44% to Rs 168.07 crore as against Rs 150.82 crore during the previous year ended March 2015. Sales rose 6.08% to Rs 1646.86 crore in the year ended March 2016 as against Rs 1552.47 crore during the previous year ended March 2015. Now, lets take another example of little known company Mayur Uniquoters which is our 8-Bagger stock. We recommended this stock 5 years back at price of Rs. 56 (adjusted price after 2 bonus issues and stock split in last 3 years, actual recommended price was Rs. 448) and today it’s available at Rs. 440 giving absolute returns of 715%. You might be surprised to know that Mayur Uniquoter is a 146-Bagger stock for investors who invested in it 8 years back. Investment of Rs. 1 lakh in Mayur Uniquoters in Jan 2009 is valued at more than Rs. 1 Crores and 46 lakhs today, that's too excluding dividend payouts. Mind boggling, isn't it? It's a fact! Company has posted strong growth YoY and rewarded share holders in big way, Company was trading at Rs. 3 (bonus / split adjusted price) with market cap of merely 13 crores in Jan 2009, today market cap of the company is 2,041 crores. It’s a fact that 38 Hidden Gems out of 52 released by our equity analysts in last 6 years (till Dec'15) have given more than 100% returns. Saral Gyan team do take care of above concerns by doing in-depth research and analysis of small cap companies before releasing Hidden Gems research reports with buy recommendation. Its sincere efforts, dedication and passion of our equity analysts that 38 out of 52 Hidden Gems released by us during last 6 years (till Dec'15) have given more than 100% returns to our members. In fact 28 out of these 38 stocks have given returns in the range of 200% to 1900%. We are pleased to share with our readers that 8 Hidden Gems out of 11 released in 2014 have already achieved their target price giving more than 100% returns to our members in period of 12 to 24 months. Hidden Gems stocks - 2014 average returns as on date is 186.1% compared to small cap index average returns of 47.2%, hence outperforming small cap index by whopping 138.9%. 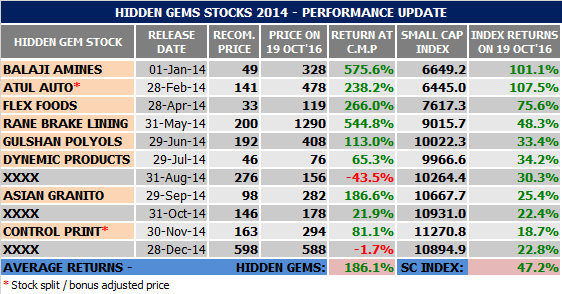 Similarly, if we look at performance of Hidden Gems stocks released in 2015, we are pleased to inform you that our Hidden Gems stocks have outperformed small cap index by wide percentage points. Hidden Gems - 2015 as on date average returns is 73.4% compared to small cap index average returns of 18.9% in 2015, outperforming small cap index by 54.6%. 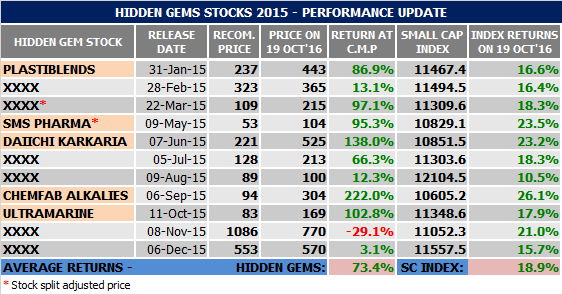 Moreover, if we look at performance of Hidden Gems stocks released in 2016 so far, we are glad to share that our Hidden Gems stocks continue to outperform small cap index since beginning of this year. Hidden Gems - 2016 as on date average returns is 47.5% compared to small cap index average returns of 19% in 2016, outperforming small cap index by 28.4%. We are pleased to inform that we are celebrating this festive season by offering maximum benefit to our members. You can avail discounts up to 30% and valuable freebies on our subscription services under Saral Gyan Dussehra Diwali Offer of the Year . Subscribe to our services and get rewarded by making smart investment decision in equities. Below table indicates subscription services and discounted prices.